President Thomas Jefferson, General Robert E. Lee, and Edgar Allan Poe all had ties to this house, and to the Burwell family. 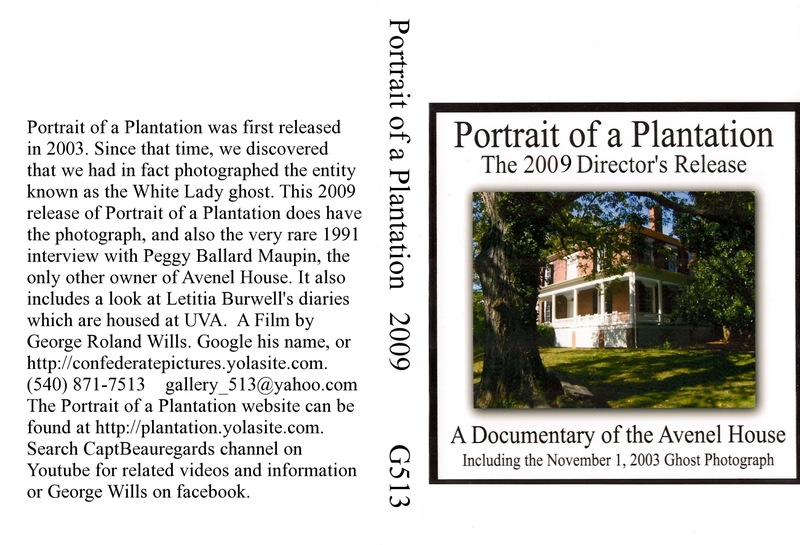 Portrait of a Plantation is the official documentary of the Avenel House in Bedford, Virginia. It is available from the Bedford Central Library as DVD 812 POR and from the Roanoke Valley Library System as DVD 973.7 PORTRA. Barnes and Noble also has this video at Tanglewood Mall in their Indie Film Maker's Program. This photograph shows the same position from where we photographed the White Lady Ghost of Avenel on November 1, 2003. She appears on the southeast corner of the front porch, in front of that black shutter, between the first two white columns... as a fully-formed woman, in a blinding white dress, with dark hair and beige skin tone. She was not there when we took the photograph, but she appears in the photograph, notwithstanding. Two witnesses standing behind her and looking right through her, at the time, saw nothing on the porch with them, at all. I personally took the photograph of what I thought was an empty porch, with the two other witnesses behind a small tree (which is gone in this photograph, but was there at the time). The apparition appeared in the photograph after it was taken, and is on the original Digital8 tape as a photo snap with seven seconds of sound. The camera was a Sony DCR-TRV 250, and took still images on moving tape. A local from Bedford, a very refined and dignified elderly lady, approached me directly after I publicly claimed to have taken the photograph of the White Lady ghost. She asked, in a very forthright manner, to see what I had to show for my claim of having photographed this ghost. I could tell that she very much doubted my claim, and was going to, as they say, 'get to the bottom of this'. This was a lady who did not mince any words, nor give any quarter. We met in town, and I showed her the photograph. She stared at it for some minutes, not saying a word. Presently, she looked up, and handed me the photograph. She looked at me very seriously, and said, "You got her!" That was all she said. She then rose from her seat, and immediately left, with her entourage, without another word. She seemed perturbed about the whole business, even though she had just pronounced my photograph to be legitimate, at least in her own eyes. To order this documentary video from Amazon.com, click here.